On February 25th, 2015, NICE and our partners at Chayya CDC, Queens Community House, and the Community Development Project at the Urban Justice Center held a policy briefing event for our most recent report, Bridging the Gap: Overcoming Barriers to Immigrant Financial Empowerment in Northwest Queens. The report draws upon 253 surveys collected by NICE and our community-based partner groups to reveal the main barriers that immigrants in Northwest Queens face in accessing mainstream financial institutions. It also provides concrete recommendations for how policymakers and financial institutions can improve financial empowerment and access for immigrant communities both in Queens and throughout New York City. Nisha Agarwal of the Mayor's Office of Immigrant Affairs and Mayur Saxena of the Civil Rights Bureau of the NY State Attorney General's office joined us at CUNY's Murphy Institute to present the findings. A panel discussion followed, featuring experts Jaime Weisberg, Association for Neighborhood & Housing Development, Inc.; Deyanira Del Rio, New Economy Project; Nancy Castillo, Center for Financial Services Innovation; and Linda Levy, Lower East Side People's Federal Credit Union, followed the report release. The discussion was moderated by Seema Agnani of the National Coalition for Asian Pacific American Community Development. 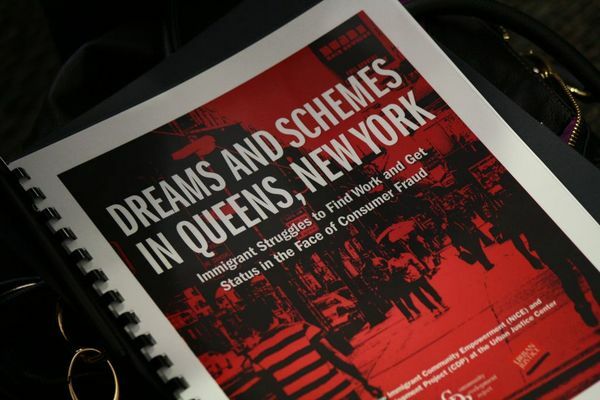 On October 11, 2014, NICE and the Community Development Project (CDP) at the Urban Justice Center released our latest report, Dreams and Schemes in Queens, New York: Immigrant Struggles to Find Work and Get Status in the Face of Consumer Fraud. The report is the result of comprehensive participatory action research by NICE members and the CDP. Its findings are based on “mystery shopper” tests for businesses in Jackson Heights, Corona, and Elmhurst, where a variety of Immigration Service Providers (ISPs), immigration attorneys and employment agencies target immigrant consumers and workers. The research also includes surveys and focus groups with immigrant consumers. By analyzing the surveys, focus groups, and experiences of the mystery shoppers, the report provides a glimpse of how employment agencies swindle immigrants out of hundreds or even thousands of dollars by falsely guaranteeing success in the job search. Dreams and Schemes in Queens, New York also offers recommendations for improved laws, policies, and enforcement mechanisms that would better protect immigrants. We released the report at a briefing and panel discussion with over 80 people in attendance, including academic researchers, community organizers, concerned citizens, elected officials and their representatives, and representatives from the offices of the New York Attorney General, the Mayor’s Office of Immigrant Affairs, and the Manhattan District Attorney. The panel featured national experts Careen Shannon, attorney and faculty at Cardozo Law School, Jason Abrams, member of AILA National Consumer Protection Committee, Laura Huizar, the Equal Justice Works Fellow at LatinoJustice PRLDEF, and Luna Ranjit, executive director from Adhikaar for Human Rights and Social Justice. NICE board member Deyanira del Rio moderated the discussion, which situated the results of the report in a national perspective and made several of its own recommendations. Councilmember Daniel Dromm, who chairs the Immigration Committee in the New York City Council, also spoke and verbally committed to working with NICE on a number of its recommendations. You can see press coverage of the event here: NY Daily News | Associated Press | El Diario/La Prensa | NY1 | Queens Latino | WBAI radio Click here to view photos from the event.